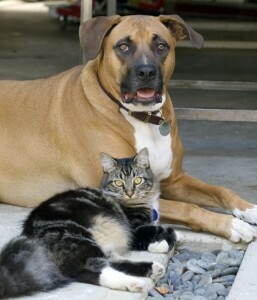 Many dogs and cats coexist peacefully and happily together, and great friendships can develop between them. Here are some helpful tips to follow when introducing a dog and cat to each other. Many dogs and cats coexist peacefully and happily together, and great friendships can develop between them. 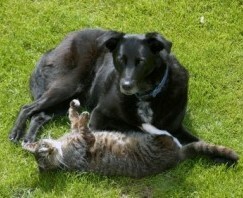 Some dogs are very gentle with cats and actually prefer the company of kitties to that of other dogs. Unfortunately, when people introduce dogs to cats, the usual scenario is that the dog chases the cat, and the poor kitty ends up hiding in the basement, closet, or under the bed. This is unnecessary and not fair to either animal — especially your kitty. Your cat should not be relegated to the basement or spare bedroom. As a general rule, your cat should have access to all the prime areas of the house and be invited to those areas regularly. Your kitty cannot be chased and your cat has to know that he or she is invited into all areas of the house. If you allow your dog to chase your cat, relegate your cat to the bedroom or basement, and just “hope” things work out, your dog will learn that it’s fun to chase your cat and your kitty will learn that you offer and provide no protection. Below are helpful guidelines to follow to introduce a dog and cat to each other and to ensure that they have a harmonious, or at least, polite and well-mannered friendship. 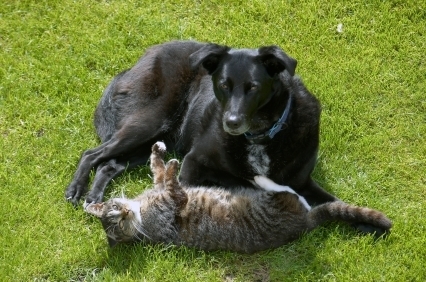 When you are not able to supervise, your dog and cat should be separated until you know they will behave well together. If you have a dog who is fearful or timid, and a kitty who is territorial or aggressive, reverse some of these suggestions. To begin, designate a room or location in the house that is entirely your cat’s territory. Teach your dog that he is not allowed in this area. Your dog should not have access to litter boxes or to your cat’s food. In addition, your cat should not be forced to pass or dodge your dog to get to food and water bowls or litter pans. There should be more than one food bowl and at least a few bowls of water in a variety of locations for your kitty to choose from. Invest in a few good cat trees or cat condos. These provide your kitty with extra territory and will make your kitty feel safer. Always place your kitty on higher surfaces than your dog. This protects your cat and makes your kitty feel more confident. If your kitty is less likely to run, your dog will be less likely to chase. Use Feliway (synthetic pheromone) plug-ins to calm and soothe your kitty. Don’t plug in Feliway near water bowls, food or litter pans. If you frequently wear a perfume, cologne, or lotion, put some on your hands. When it dries, pet your animals. This way you can create a “communal” scent. Scent is very important to animals. If your dog and kitty smell similar to you and to each other, they may bond more quickly. Be sure to give your kitty plenty of attention. Exercise your dog before introducing him to your cat. If your dog has just run a few miles or played ball in the park for an hour, he will be a bit calmer, and hopefully a bit more relaxed. Do not introduce your dog to your cat if your dog has not had any exercise. Introduce your dog to your cat when your dog is tired, resting, or sleeping. This is also a good time to provide your dog with a chew toy, treat ball, or other food-dispensing toy. While your dog is sleeping or resting, feed your cat treats on the cat condo or sofa, or pet and brush your kitty on your lap. Do not bring your cat over to your dog and force or push an interaction. Use a front-clip body harness or head halter when introducing your dog to your cat, and make sure to have your dog on a leash. This will give you more control, and will prevent your dog from chasing your cat. Always keep the leash relaxed. If you feel your dog and cat are doing well together, keep the leash on your dog but don’t hold the other end. Let it drag behind him. This way you can lead him out of the room if you need to or prevent him from chasing. Feed your cat and dog extra good food and treats when they see each other and feed them meals at the same time. If your cat is afraid of your dog, feed them in separate rooms but so they can see each other. This establishes a positive association between them and gives them a reason to like each other. Reward your dog anytime he looks away from your cat. Teach your dog using positive reinforcement when your cat is in the room. This will teach your dog to listen to you and to behave when your cat is present. It’s also fun and rewarding for your dog. Alternate between treating and/or playing with your cat and treating your dog when they are in the same room together. Prevent your dog from chasing your cat by immediately interrupting your dog in a calm way. Redirect him to a more appropriate behavior, such as chewing on a toy, coming to you, or lying down. If your dog barks or lunges at your cat, remove him from the room temporarily. Treat and reward your kitty. Bring him back in and reward him for being calm, friendly, and gentle, and for ignoring your cat. Alana Stevenson provides phone & skype consults and can be contacted through her website AlanaStevenson.com. You can purchase a copy of a her book Training Your Dog the Humane Way on Amazon. 2 greyhounds and a kitty! I have cats and a bird, and they get along! 4 greyhounds and 4 cats and they adore each other. Took the cat a few months and now we’ve been all together for about 2 years, last night they slept in the bed 😀 They are happy together! My little rescue kitten cuddles with my big rescue dog…super adorable! I have one Irish Setter and FIVE cats (three are Bengals). They get along great. They have ‘games’ they play together… and even have their own ‘code of rules’ to those games. Very neat. At the end of the games, they cuddle. Three dogs, 2 cats….they play together, sleep together…its awesome!! Had both but both my cats have passed away of OLD age (18 & 14) they got along w/my 3 dogs. i have just one dog now…but have always had both dogs and cats together before…and they ALWAYS got along!! Three Golden Retrievers and 13 cats. Cats and dogs get along well! They sleep together, play together and groom each other. The dogs chase the cats so everyone gets their exercise! 5 dogs and one VERY demanding Siamese cat here. For the most part they get along. I think it is more a learned respect for each other. I have one puppy G.Shepard 1 old 15 year old cat 5 yard cats.. that people drop off.. I had them fixed. They just put up with each other.. Lol .. what work. I use to an they got along great. In fact they were introduced as adults an they still got along. But then again they were two very smart breeds GermanShepherd an a Siamese. Miss them both. wish my two dogs & one >^..^< would stop the attitudes, 5 beautiful acres isn't enough room for em. can't we all juzz get along? 1 small munsterlander pointed hunting dog, 1 cat. They are the best friends, but any cat outside, is prey! my only dog is driving crazing with two lovely cat in my sweete home!!!……LOL! Our cat is the boss in our house. Our dog wants to play with her and sometimes they chase each other around (playfully) but mostly if our dog gets too close my cat will hiss and swipe at her. I had at one time 4 dogs and 2 cats. They got along great! One of the cats pretty much pretended the dogs didnt exist, so the dogs did the same with him, but the other cat… I think he thought he was a dog! He LOVED to play fetch and be in on whatever the dogs were doing. I will say, when the dogs got too rough he kinda backed away and would sit on the back of the couch and just watch, but he LOVED to be with them, lol! We adopted a cat last year and both my standard poodles groom her. They also like to chase her and she likes to swat back. We don’t let it get out of control, but they really enjoy her. She is very protective of us and once ran off a puppy pit bull that was bugging us while we were all on a walk. Yep, my cat takes walks with us. She’s the bomb. The cats love the dogs more than me! !! And who buys all their stuff?? They do. Really well, I have to say. I guess they know they are all in one big family. GSD loves one cat, won’t have the other in the same room! 1 dog, 2 cats. Both cats tolerate the dog, one even kind of likes her. The dog can be gentle with them sometimes and downright trample them other times. They all learned to live together. Got distracted by thinking of that number of cats in my house.. 1 cat and 2 dogs here and for the last 5 months always 1 foster dog (we are on our 4th) Our cat is awesome! He knows which dogs will ignore him, which just want to play, and which want to eat him and limits his interactions accordingly! He loves our setters and cuddles with them, and rubs against them all the time. We adopt a cat in Oct 2011. We had our dog for 4 years and thought they would not get along but I was wrong they are best friends. Luna our cat gets excited when she see Jetta and for Jetta doesn’t mind getting the attention from Luna. 2 dogs 3 cats! I have always had both, their individual personalities decide the relationship dynamics, but they always get along with each other! I have two dogs and two cats. They coexist, but aren’t exactly buddies. Dogs still chase the cats around the house and cats still run, but no fights have ever occurred. I think the cats were too old and set in their ways to accept new dog pals. They were terrified of each other for the first week, now they play, sleep together and follow each other around. I have 2 shepherd mix dogs and 1 tabby cat. The love each other. Chase around the house like idiots in the morning, but all snuggle in my bed at night! Yes!! My dog thinks she is a cat and tries to jump up on table tops and balance on the edges of furniture (not always with great success). And my cats think my dog is a funny, odd cat. They clean each other, say good morning by rubbing noses and cuddle on the sofa. I have a chocolate lab and a tortie. They love to curl up on the dog bed together and nap. Also the dog loves to give the cat kisses. how adorable is that photo?? LOL. I have six dogs and two cats. They are one big, happy family. The cats love to rub up against the dogs. 1 dog, 2 cats, no one gets along with anyone else. The dog just wants to play with the cats, but they have no interest whatsoever. One of the cats is pretty indifferent toward the dog; the other one taunts the dog to no end. Their only common denominator is they love me. My terrier is not a cat fan in any way. My hound has lived with my dad, who has cats, and while the dog was not *thrilled* with the idea, at least all the cats are all still alive. I have one retired racing greyhound and two cats. They co-exist peacefully though don’t interact a lot. The dog is much more leary of the cats than they are of her. There’s occasionally sniffing, sometimes brief play, and they’ll share a couch or human bed. In the two years they’ve all co-existed, they’ve come a long way! My poodle loves both her cats, but the boxer hates one of them, so we must keep them separated. 4 large dogs – 2 weimeraner’s and 2 golden retriever’s & 1 cat with a huge personality (ocicat) – they get along great!!! I have raised cats and dogs together for a very long time. Some cats love dogs and some never will. ( even if raised together) They usually get along well even if there isn’t real ‘liking’. With dogs, I’ve found that puppies love cats if introduced fairly young. Be very careful with older dogs! No. The greyhounds we adopted were not cat safe which is in part why we chose them. Two family members developed severe cat allergies (hospital & ER severe) so pretty much a no brainer. Best to let cat safe greys to go to homes with kitties. 5 cats 3 dogs,,they are family. Always had both. They grew up together, and get along great!!!! Yes they do. It took awhile, but now they love each other. They get along great. My lab actually is well known for finding lost kitties and bringing them home with her. My cat and my two German Sheps get along great! The cat will even seek out attention from the dogs. They groom each other too! Each of my 3 rescue dogs has their own cat. All get along just fine. Yes I have 2 Poms and 2 cats….they all get along very well!! My current cat was rescued at age 3 and never lived with dogs. My dogs were 3, 6, and 11. The cat has always been fine with all of them. The two older dogs tolerated her, and the younger one likes her. No problems! They work it out. Yes, 2 dogs (one german shepherd and one french bulldog) and a calico cat. They all get along and love one another and somehow the 7 lbs cat is the boss. I have 3 dogs and 3 cats. They get along really well. My tom cat actually saved my little dog from a pit bull attcak. The pit was attacking my dog and Junior jumped on his back and made him chase him instead. Then he ran under the house while I grapped my dog and ran in the house. We have a boxer and a German Shepherd and we brought a stray cat in. The cat is obsessed with the boxer and cuddles with her constantly and plays with the GSD constantly. They all get along. Yes i have a lab pup and 2 cats….. My older male cat abd dog get on really well most of the time but my younger female cat dont get along at all…. He tries to play with her but ahe hates him…. Hisses n scratches him if he gets too close haha!! We have an american pitbull terrier and a tortie and they love each other. Well the dog is kind of indifferent, but the cat thinks shes her buddy. We find them sleeping on the dogs bed curled up together. They will spoon sometimes. I have a pit bull, a pug, a yorkie mix and 5 cats. They get along pretty well, except for the 2 little dogs like to gang up on the cats sometimes. I use a squirt bottle filled with water to discourage that.